So, guys, it is really common right everyone makes their new goals each new year? Do I. I also has made some goals for this year. I would like to share some of it. May, by that I will be more motivated to reach all of it. I really hope this will really happen cause I just miss having a talked with you guys, share something beneficial and some part of my life. Furthermore, I would like to make this blog become one of a successful blog. So, you guys can drop any idea that you really want me to share about it in this post. I just miss how I spend a lot of my time reading before this. May by this goal, I will really make sure that I spend a lot of my time reading more after this. Furthermore, I want to increase my knowledge and increase my language skills. By that, I will have more idea to stay update this blog, right? So, did you guys have any suggestion books for me? If you guys, do not know, I have done some of the business. I became a dropship. You guys can refer here to get more information about my business: My New Business. May my business become more successful this year. So, I really need support from you guys. You guys can follow me on Instagram to be more updated about my business. If you guys have any experience or tips about your own business you may share with me in the comment section. I think I need to reduce my time on social media cause my time is really limited for unbeneficial things. When I spend more on social media, it makes all of my works become late and postponed. So, starting from this year I would like to use my social media only on needed things more than wants things. So, did you guys have any tips for this? Among all of the languages why must English? I choose English because I would like to increase my English skills in all aspects either reading, speaking and writing. By now, I really love to watch Aida Azlin's videos. It is because it just not in English but the content also good. It really calms my heart and my soal. It also makes me always reflect myself back. You guys can watch her video and follow her on Instagram and subscribes her Youtube Channel. It is really worth. So, these are some of my goals for this year. May Allah ease me to reach all of it. Ameen. So what're your goals for this year? You may share it with me here! 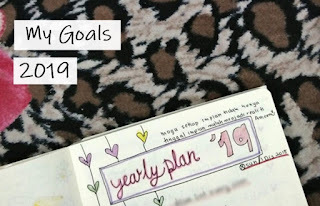 Hmm ... elok senaraikan goals untuk tahun 2019. Boleh buat perancangan. Betul tu. Kita pun akan jadi lebih bersemangat nak capai sebab kita lagi jelas dengan goals kita.